I walked through Carrion filled with wonder. There was so much more of it than I’d seen in 2013. Plazas and stores, and finally, a sparkling river. I circled back to the 12th C church of Santa Maria. It was open. That was where we’d had the classical guitar concert, Mass and pilgrim blessing in 2013. In April, things were quieter. Fewer pilgrims, no Mass that night. This crucifix was German, from 1350. 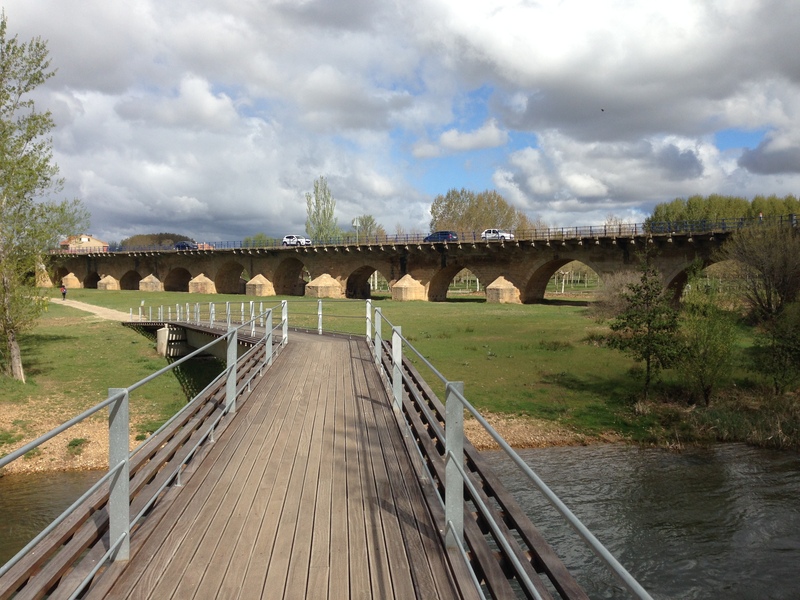 It has the same Y shape as a famous one in Puente la Reina. How did it get to Carrion? Did a German pilgrim carry it here? 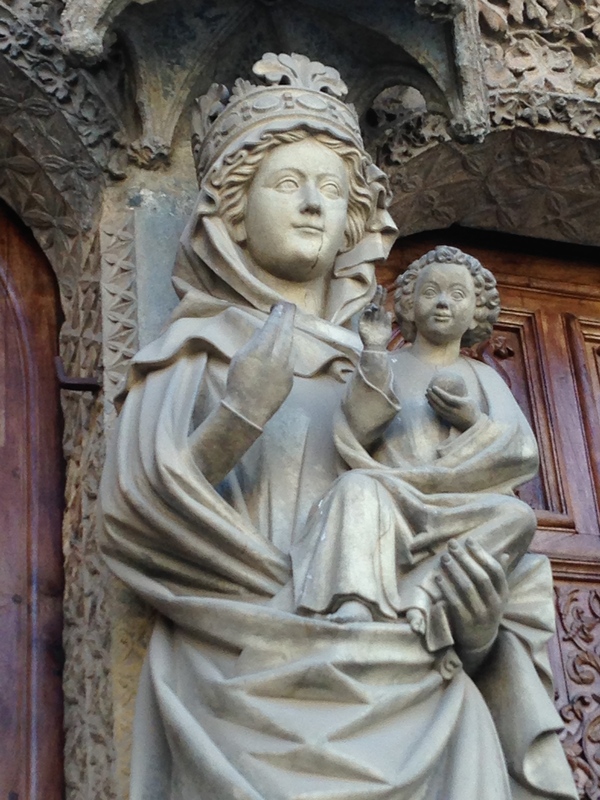 A beautiful Madonna and child from the 13C. St. James, as a pilgrim. I said a prayer for the people of St. james/Santiago, Oakland, back home. Spending time in Santa Maria made up for all the closed churches along the Way. I was so thankful to return to Carrion and to be a Peregrina again. I gave thanks for good health and prayed for all the injured pilgrims struggling to continue. Carrion was the place where all the days of walking 20k+ caught up with people. It had probably always been that way. We talked about our prior Caminos, and how there’s always more to learn.Then we found ourselves behind a church that overlooked the river. It was so quiet we could here the water burbling far below. “The 23rd Psalm,” was all Tammi said. Indeed. My experience of visiting Carrion again showed me how much bigger God is than the little boxes we create for God in our minds. It was filled with Camino moments. The Holy Spirit, Espiritu Santu, flowed through that day, like the river. 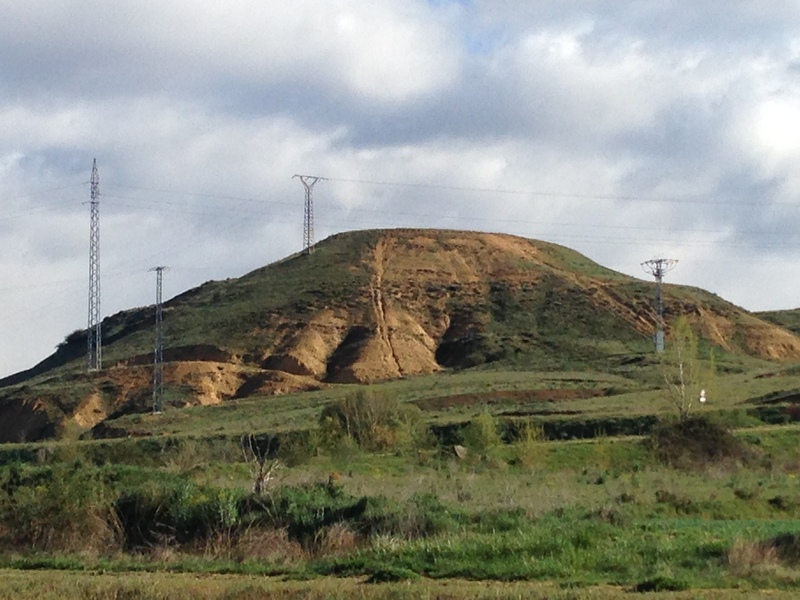 Yesterday I walked 20k, from Burgos to Hornillos. I considered taking a taxi out to the outskirts of Burgos like I did when I left Leon in October, but the purist in me won out. 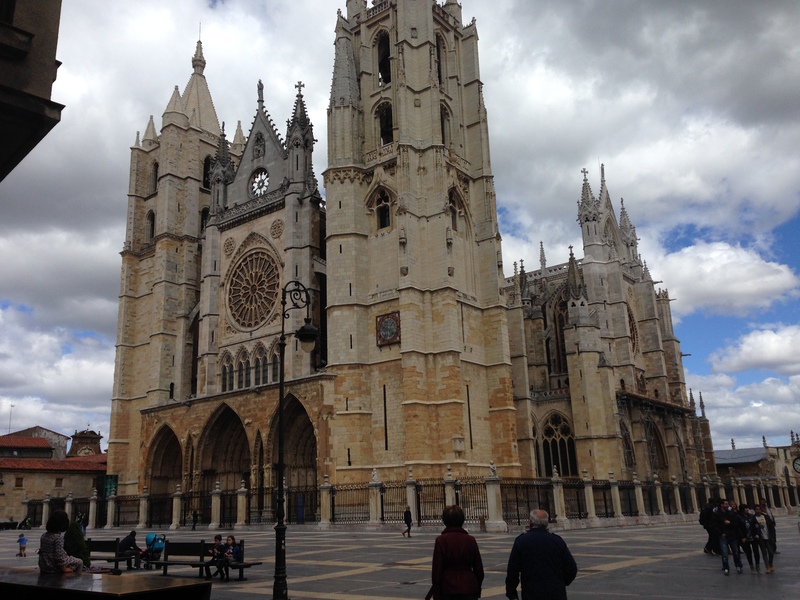 After settling up my hotel bill, I crossed the plaza to touch the Cathedral and say a prayer, and then stepped onto the Camino. The way out of Burgos took awhile, through city streets, past the University, and through a gate and a alley of trees that looked familiar. I think it was one of the locations used in The Way. When Martin Sheen leaves Burgos, the Dad of the young thief makes him carry Martin Sheen’s pack down a long alley of trees until they get to a gate at the edge of town. This looked like the place. 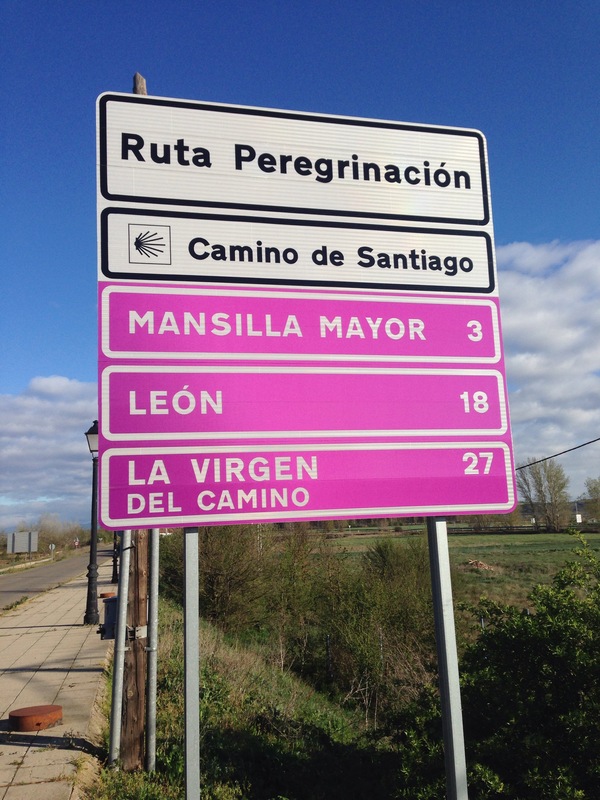 Then the Camino passed the penitentiary, and what’s known at home as the “corporation yard,” alongside the highway, the railway, and the autopista. As I was trying to find my way through several unmarked intersections, I ran into my first pilgrim. Gabby had just taken a 25 hour bus ride from Germany. We walked together the rest of the day. 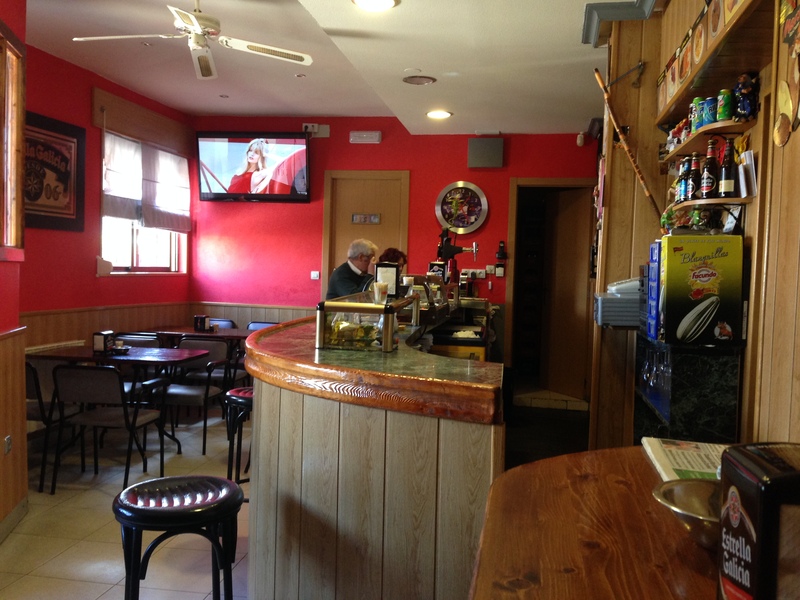 By kilometer 10 we reached the village of Tarjadas and had lunch at the neighborhood bar aka pub. The energetic woman behind the bar was cook and bartender, and the place was filled with locals. My Ensalada Mixta was freshly made, and they had interesting tapas made with quail eggs. After taking off my boots and letting my feet breath, I was relieved to find that there were no hot spots. (I’ve become very protective of my feet.) Onward! 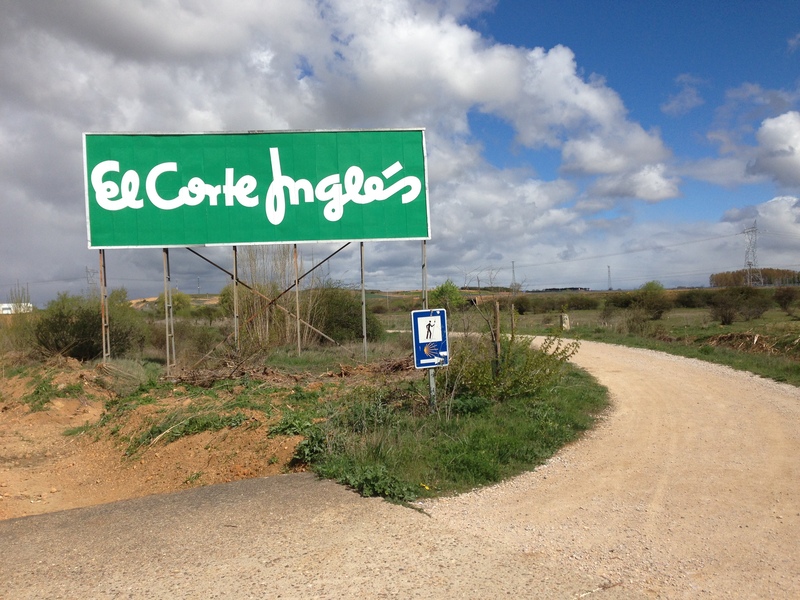 Another 10k took us out into the countryside and up onto the Meseta. Looking back, towards the East, we saw a mountain range fringed with snow. Everything was green and bursting with new life. Gabby shared with me the names of the birds in German. 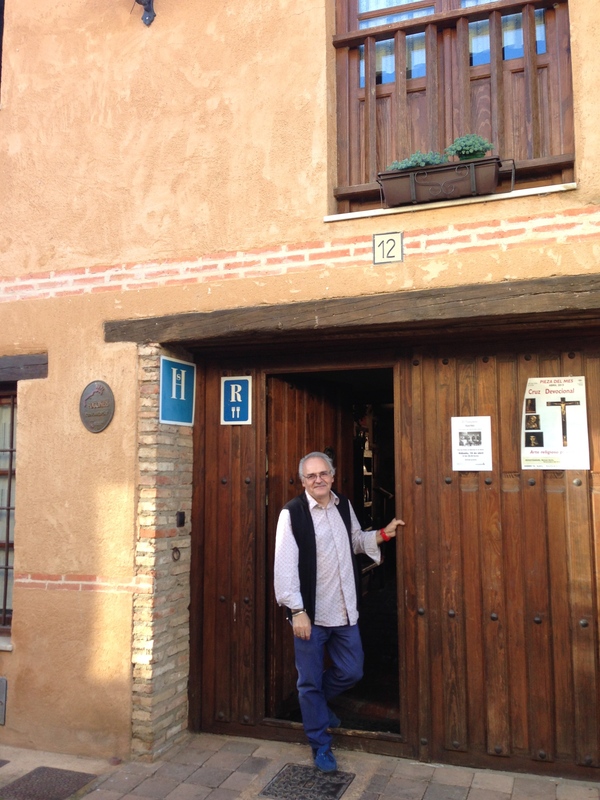 Finally, we made it to Hornillos, and checked into Albergue Alzar. 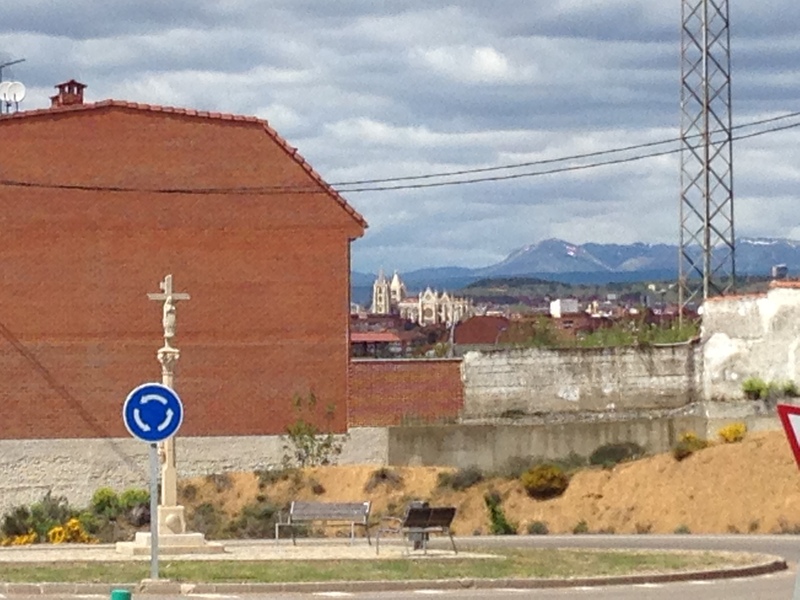 I like all sorts of accommodations on the Camino, but I have a fondness for the private Albergues. 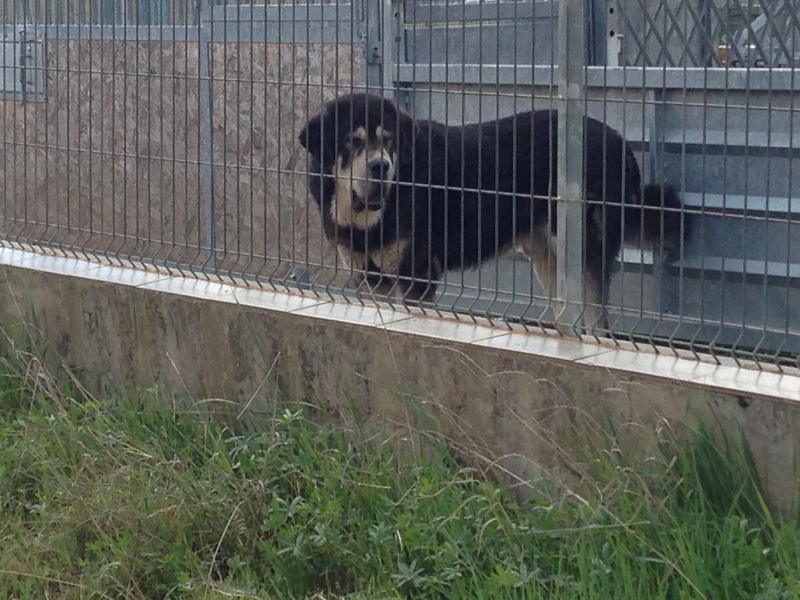 They’re usually run by a family or couple, and offer a communal meal. After a restorative shower, the six pilgrims in residence gathered for dinner. Our hosts served paella, salad, wine, and dessert. 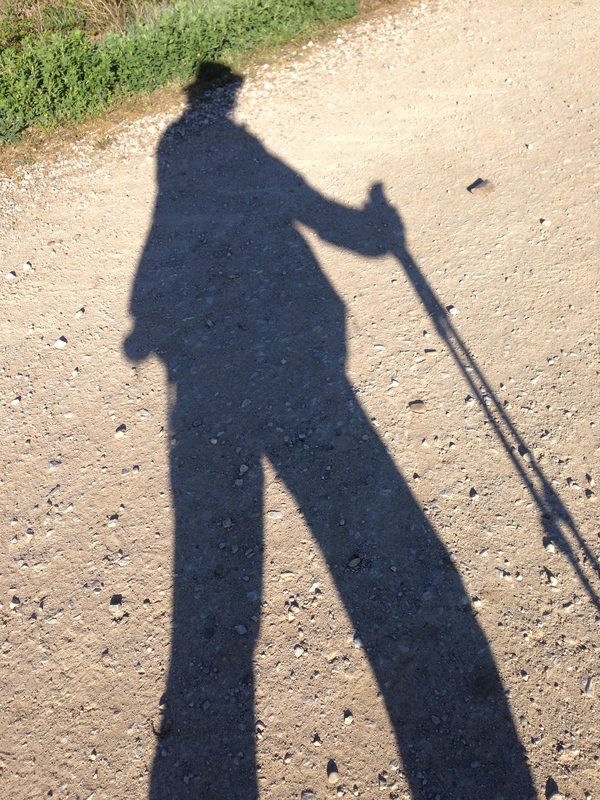 There were two women from Valencia, a couple from Belgium who started their Camino at home and continue to walk several weeks a year, Gabby, and me. One of the many things that I love about the Camino is this: it brings people together from many countries to share a communal experience. And last night the owners of the albergue were very involved in the dinner conversation, and it was fun to wade in in Spanish. Between us there were four languages spoken, but we had a lovely dinner party talking about our travels and sharing photos we’d taken as we walked. 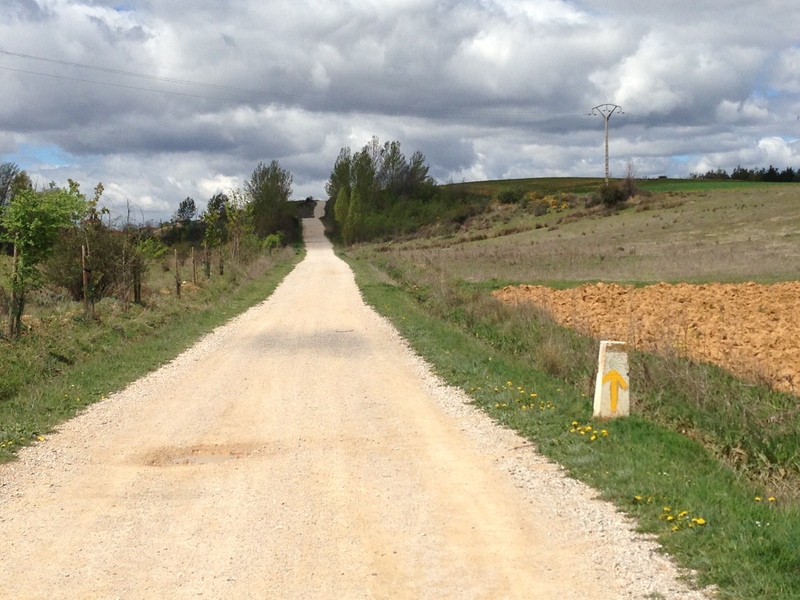 I’m finding myself more interested this time in Spanish culture, and what it’s like to live along the Camino. With jet lag and 20k under my belt, curling up in my sleeping bag on the lower bunk was wonderful. And my new white noise app and headphones, made even the more challenging aspects of communal sleeping easier this time.